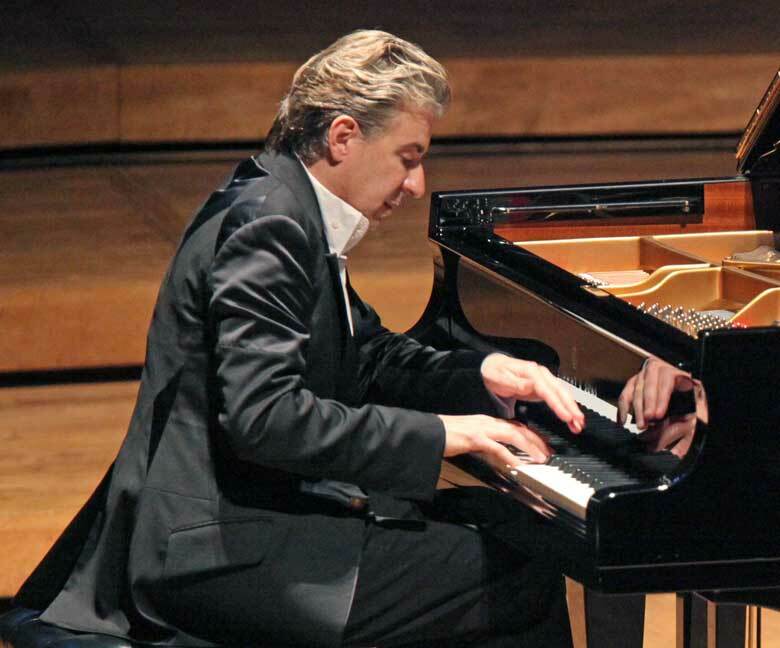 Jean-Yves Thibaudet has been living with and playing the piano music of Maurice Ravel (1875-1937) in public for at least two decades; in fact, the pianist claims to have learned all of Ravel’s solo piano music by age fifteen (He will turn fifty in about six weeks. ).He recorded it in 1991, a recording still available. The Thibaudet-Ravel spiritual cohabitation goes back even further; Thibaudet studied (as did Pascal Rogé, who also recorded the complete Ravel solo piano music in 1994) at the Conservatoire de Paris with Lucette Descaves, who in turn had been the student there of Marguerite Long, friend and collaborator — although not a student — of Ravel. In back-to-back performances at Tanglewood’s Seiji Ozawa Hall on July 20 and 21, Thibaudet did not play the works in chronological order across both programs, as he does in the recordings, nor did he group together all those of the same style or type, but rather he creatively assembled two diversified and very satisfying programs that built to the climax of a major and/or revolutionary work. The first concert contained the two earliest works, which opened each half (in inverse order), and the last works. The second program opened with what is perhaps the most famous piece of all, the Pavane pour une infante défunte (1899), which became for Ravel, much like the Prelude in c# for Rachmaninoff, the work he could not escape, so came to loathe because it was too often played like a funeral dirge (He once quipped: “It’s a Pavane for a dead princess, not a Dead Pavane for a princess!”) Thibaudet was not guilty; he moved it along at a steady, if languid pace, and followed it with a sparkling Jeux d’eau. The remainder of this second program was devoted to the three other larger-scale works, with Valses nobles et sentimentales (1911) closing the first half and the Sonatine and Gaspard de la nuit, considered by many to be the most difficult piece, forming an eminently contrasted pair for the second half; its opening Ondine recalled the Jeux d’eau for an echo effect. Thibaudet’s playing was impeccable and masterful, straightforward and non-demonstrative, just what the composer declared he preferred. The music flowed out of his fingers naturally, seemingly effortlessly, even in the fastest tempos, as if it were his own. He obtained all the required dynamic contrasts and rhythmic and tonal variety and was appropriately judicious with the pedaling. The notes were all sparkling and crystal clear – Ravel does not call for much legato, yet he obtained the atmospheric effects in the works such as Miroirs and Jeux d’eau that require them, without any blurring or haze whatsoever. The works such as the various Menuets and Le Tombeau… that evoke the French Baroque past were executed in a style that would have been perfectly recognizable to Couperin, his colleagues and immediate descendants, even if the twentieth-century harmonies would have been entirely alien to them. One might have anticipated that, after some thirty-five years of living with the music, a performance might show some signs of becoming perfunctory and stale, but there was nothing of the sort. All of the playing seemed morning-fresh; much of it was absolutely magical. For me, in the first evening, Le Tombeau… stood out, with its Forlane elegant, its Menuet an exquisite filigree and its Toccata a flashing blaze of light as if from a shooting star, executed without any distracting physical display. Miroirs was equally superb, but a misprint in the printed program, which inverted the order of the final two movements, led the audience to burst out in applause after hearing and recognizing the music of Alborado del gracioso (printed as the last, but correctly played as the penultimate movement) before La Vallée des cloches was played, thus shattering the spell. If anyone thinks a seemingly minor printing error of this sort is inconsequential, this is vivid proof to the contrary! Gaspard de la nuit, impressively rendered, was the star of the second evening, but the Sonatine was delicately and exquisitely executed. The eight Valses nobles… moved along, progressing so smoothly from one to the next, often without a marked pause, but carefully distinguished, that they were too soon over. Thibaudet is probably the greatest living interpreter of Ravel. I have certainly never heard him played so well in a live performance by anyone, anywhere, before. The music seems to be as much a part of him as it was of Ravel. He may be the last pianist in the direct line of descent of those who had personal contact with the composer (I do not know if any of Perlemuter’s pupils are playing Ravel regularly, but Rogé has devoted much less of his career to the composer.). I personally hope he can identify, or has already done so, someone to whom he will pass on his expertise, knowledge, style, and touch, all of which struck me as perfection personified, or as close to it as anyone other than the composer himself could possibly come. I was apprehensive in advance that I would be disappointed, so familiar and in love with this music am I; I was instead completely enthralled. I also enjoyed reading the fine program notes by retired Boston Globe reviewer Richard Dyer. The first evening, Thibaudet rewarded the audience’s enthusiastic applause with the Chopin Nocturne in Eb, Op.9/2 played from memory; the second evening, using a score, he played Jeunes filles au jardin by Federico Mompou. The weak spot in the perfection of these brilliant performances, however, was the piano, even if Thibaudet obtained from it all that he did, far more than most can. Steinways are not designed or built to produce color; they aim for uniformity across the keyboard’s registers and for power and volume. Ultra-soft is well nigh impossible to achieve, though Thibaudet got close. It is for this power and volume that Steinways won out over other makes in the battle for dominance of the concert hall. Ravel did not own a Steinway; he played mostly Érards, and owned one (perhaps more than one over his lifetime? ); it is still present in his home in Montfort-l’Amaury , the small village southwest of Paris where he spent his last sixteen years. He spent fourteen years at the Conservatoire de Paris, where Érards were then the official instrument. He probably played Steinways at least a few times on his four-month 1928 tour of the U.S. (that included a stop in Boston, where he conducted the BSO playing his music in Cambridge on January 12 and in Boston on January 13) where Érards were essentially unknown, but we don’t know what he thought of the Steinways. I know I don’t think they can match an Érard for an interpretation of his music because they can’t match the diversity of color among the registers that he was accustomed to and without a doubt wrote for. The Érards were probably gone from the Conservatoire by the time Thibuadet arrived there in 1974. He ought to pay a visit to the Frederick Collection in Ashburnham and try out some Ravel on its 1877 Extra-grand modèle de concert, a finer, if older Érard than Ravel’s. Might it give him additional insight into how this colorful and nuanced music was really meant to sound? I suspect he’d be enchanted. Readers can hear Le Tombeau de Couperin played by Junghwa Lee on this instrument there on 2 October 2. I’d love to hear Thibaudet play just any Ravel on it! Perhaps he’d consider making a second recording of the complete Ravel, as did Perlemuter, about two decades or so after his first, using this incredible instrument? It would be a real knockout; it could be a blockbuster!